Each person at least once in life saw berry which is very similar to raspberry. But difference was only – it is color. Raspberry usually bright red, and cloudberries — yellow color. Very often this berry is added to milk yogurts and ferments. So, if you don’t know about its useful properties, then this misunderstanding needs to be corrected as soon as possible. Cloudberries — useful berry. It not only contains in the structure vitamins and minerals, but also an acid omega-3. As it is known the last, are irreplaceable for our organism. Due to the unique structure, this berry is irreplaceable for a skin therefore it enjoys wide popularity in a cosmetology. As for hair and fingernails, at the regular use of berry, they will become stronger and healthier. Very often berry is pickled and presoaked. From it it doesn’t become less useful. Besides it is an excellent way to keep berry for the winter period. 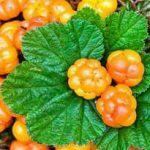 We pay attention, it is better for people not to use cloudberries with diseases of a digestive tract and an allergy. Even, if you have no problems, then all need a measure. Cloudberries are often called female berries because of the unique beneficial properties that are necessary to preserve the beauty and health of any girl. The product contains a complex of enzymes that speed up metabolism, suppress appetite and remove excess water from the body. Due to this effect, the work of the digestive system is improved, the total body weight is reduced, and the overall health of the cardiovascular system is also improved. In addition, the product is a source of vitamins and trace elements necessary for the functioning of all internal organs, liver and intestines. Also, doctors recommend to use this product during pregnancy, because cloudberry contributes to the intrauterine development of the baby.